Lately, we have been thinking a lot about taking a long-term trip. We don’t know where we want to go, how long we want to go for, or anything else. However, everyone keeps telling me that if we really want to do this, that we just need to buy a ticket and everything else will just happen from there. I read many, many travel blogs. Some of these blogs tally up their monthly expenses in a report each month, which I really enjoy reading. However, the amount of money that each person spends varies very widely. Some may spend $2,000 each month, whereas others have a $9,000 monthly travel budget. This is expected of course, as everyone has different traveling tastes. Some prefer to spend their money purely on experiences and don’t care where they stay. Some will couch-surf as much as they possibly can. Others prefer to stay in nice hotels and have more expensive tastes. We fall in the middle. We don’t want to stay at a one-star hotel unless we have to, but we don’t need to stay at a five-star hotel either. We do care about gaining valuable experiences and trying as many new food items as we can as well. 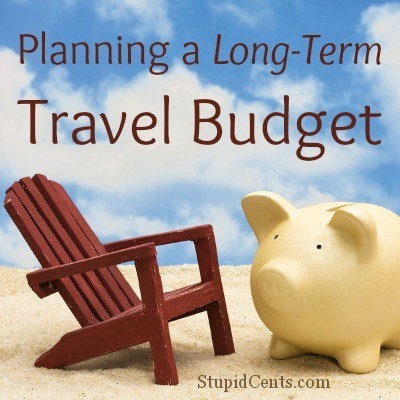 Even if you are like us and you don’t know where you are going or how long you want to travel for, there are many expenses that you will want to think about when planning your long-term travel budget. Transportation can vary widely from person to person. You can fly to each and every single place that you want to go to, or you can do a mixture. There are trains, buses, ferries and so on. Your transportation costs will be higher if you travel to new places more often. If you stay in an area longer, then your transportation costs will be much lower. Transportation will be a large part of your budget, but accommodations may be even higher. If you stay in one place for a long time, then you may be able to find a short-term lease and save some money. Accommodations also vary depending on your taste. Staying in hostels will save you a lot of money if you are traveling alone. However, if you are traveling with another person, then staying in a hostel may be near the same price as staying at a budget hotel/motel. If you are like me, then you like to eat food. I like to always try new food when I am in a new place, and I will eat until I am beyond full. You can save money on food by preparing food yourself. Also, areas such as Thailand are famous for their very cheap food. I recently had a friend visit and her favorite meal consisted of a $1.50 entree and she ate it for almost every single meal it seems like! Other areas will have more expensive food, such as countries in Europe. Traveling is always about the experiences. I am perfectly fine with sitting on the beach for days at a time, but I also like to try something new such as snorkeling in a new area or para-sailing. Experiences are usually very expensive, but can vary from place to place. If you can entertain yourself and would rather explore on your own terms, then your experiences will most likely be much cheaper. Extra expenses when planning long-term travel can include passports, visa fees, health insurance, trip insurance, internet, backpacks (or suitcases), shoes, clothing and so on. If you have your own home and plan on keeping it while you travel, then you will have to pay the expenses for your home as well. Are you planning a long-term trip? How much do you think you will spend?